Oak Barrels Ltd. Enthusiast ... Thank you for taking the time to drop us a note. We love to hear from you! If you are visiting our site for the first time, we're happy to share a few experiences from our customers! We'd love to hear your thoughts on our American oak barrels, or whatever else you would like to share. What a pleasure it has been to get such great customer service! This is light-years ahead of one of your competitors, and you have just made me a customer for life. The 5 liter is perfect for a hobby person. Small scale product operations do not yield enough product to fill larger barrels. I used one to age Scotch, one for bourbon and the quality of the product after 2 months was exceptional. After initial use I used the bourbon barrel to keg a batch of home brew and one was used to "temper" a batch of store bought rum. Results across the board were outstanding. Note these barrels will weep so the Angel Share was high but the devil's share was great. The quality of this Barrel is more than I expected, this is top notch. The engraving is outstanding, I recommended it to my group and there is going to be more orders, even for larger sizes. I highly recommend these barrels. Hannah, I'm not sure if you remember but my company and I placed a couple of large order with you last year. I just wanted to let you know that my company and our customers have been extremely happy with the barrels. Everyone has really enjoyed them and they have been the discussion of so many cocktail hours and business meetings. I still have one more box to go through and then I'll probable be placing another order. I thought i would just drop you a line and tell you how happy we've been with the barrels. Keep up the great work. I don't know what's better ... the customer service or the quality of your product. It's a WIN, WIN in my book! Thank you Oak Barrels, Ltd.! Thank you so much for the great service. You guys have become quite the rave in Naperville! I I just wanted to take a moment to let you know that the barrel arrived this afternoon and it is absolutely beautiful. My sister is going to love it. Thank you for your help and patience, and if I learn of anybody in the market for an aging barrel I'll be sure to direct them to you. Thank you for your professional and prompt responses! May your holidays be merry and bright! We look forward to ordering more barrels in the future as well as recommending your company to others! Cheers! I am having way too much fun with the barrels and am becoming one of your best salesmen. I believe I have infected a good number of my friends with the barrel bug. Thank you so much for a great product! I ordered the 5 Liter barrel and had it engraved for my father-in-law as a birthday gift. From the ordering to seeing his face when he opened it, the experience was great. Easy ordering, very competitive pricing, well packaged, and an outstanding product has earned my loyalty and business for all future barrel purchases. Thank you! Never again tire of making the perfect cocktail time after time. Instead just make one excellent 2 liter Negroni/Boulevardier/Vieux Carre'/(Tequila/Rye/Brandy) Manhattan, and add a few weeks of patience, ice, and a stirring spoon. Or even just the barrels and some small tasting vessels. Reasonably priced. Negligible leaking even on the first use. And some of the most phenomenal service you've ever had from Hannah. What are you waiting for? I have two 5 liter barrels and two 20 liter barrels made by Oak Barrels Ltd. They are top quality, carefully crafted and charming to look at. None of them have EVER leaked a single drop, even when first filled with water to prepare them. They are being used to age fruit spirits and very quickly impart a beautiful color and smooth mellowness to eau de vie. (I had bought a couple of 20 liter barrels a little cheaper from another company and was exceedingly disappointed. They leaked from the beginning and are now being used as planters in my yard where they are quickly disintegrating!) I will ALWAYS buy any small oak barrels I need from Oak Barrels Ltd. I'm so glad I found Oak Barrels, Ltd. I've purchased from other companies before, and nothing compares. Cheers to you guys! What a speedy delivery - I can't believe it! Thank you for helping me pick out the perfect size barrel for me. This is a one of a kind product! Thank you for your great customer support. Your customer service is top notch! They don't make companies like Oak Barrels, Ltd. anymore! I checked on the front porch when I got home last night and my package was there waiting for me just like you said. I opened and filled the barrel with water immediately to condition it and it sealed right away. This is a beautiful cask and the craftsmanship is amazing. Your customer service exceeded my expectations by a mile. I am so appreciative. It's a wonderful cask and you have the best customer service I have ever encountered. Thank you so much for my barrel! I love it! We got it in the mail today and you guys did a beautiful job. It's everything I was imagining it would be. Perfect for our whiskey unit ceremony. Thanks for all your help with the engraving! I am very impressed with your customer service (and I am in charge of consumer affairs for a very large company). I am very happy! Great job! My barrel just arrived and looks great! Thank you for your great customer service and speedy delivery. I just wanted to thank you for excellent customer service. Not only did you replace my barrel, but my replacement was engraved just like my Christmas present from my son. Thanks again, I'll spread the word about this! I just loaded my barrel. I love it. Now the magic starts. I love fermenting and I think this is just the beginning for me. Thanks for being so pleasant and helpful. I purchased a laser engraved barrel and absolutely LOVE the quality. I was questioning the artwork I wanted engraved and Hannah walked me through the whole process ... she even custom designed a few different templates for me to choose from and made ordering so simple! Thank you OBL - job well done! I can't get over Oak Barrels, Ltd. customer service. It's so nice to actually be able to talk to a PERSON ... and your response time is impressive. Greatly appreciated! We just used one of your vanilla barrels to age Tabasco sauce - it's GREAT! We're also aging bourbon in our other vanilla barrel after I made the extract ... when we're done aging the Tabasco sauce we will add vodka to make our Bloody Mary spiced vodka. Hell, we use to never drink ... but we can't get enough of your little barrels! Love your products ... I shop nowhere else! Second time buyer - HIGHLY satisfied with my first two barrels! I've researched a lot of other barrel companies ... but I always buy from you. I love your barrels - thank you for a great product! I have one of your 5L vinegar barrels ... I can't get over the taste and aroma of my red wine vinegar that I've aged in my barrel. I'll never buy store bought vinegar again! I ordered 20 liter barrels from amazon ... they are bad craftsmanship, leaking for 5 days, and look cheap. I love your barrels. You can be proud of the quality. 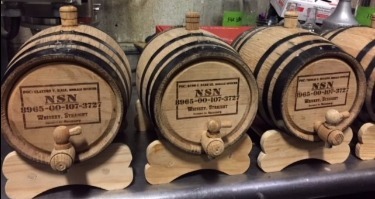 We just received our little barrels - they're wonderful! I can't believe how quickly they shipped ... especially during such a busy time of the year. Can't wait to order more! Thank you! We have received your barrels last week and love the way they look. Thank you for your quick and useful help in sourcing the barrels. We can’t wait to give them a try and try our hand at micro aging. Wee will keep you posted about the development of our product and keep in touch in case we want to buy more barrels. We wouldn't buy barrels from anyone else! You guys are unbelievable. Thanks for such a quick turn around on our order! I stained and sealed one for decoration on my fireplace hearth. The oak used turned out beautiful!!! Thank you for a great product! Thank you for helping me place an order, Hannah! I found you through a Google Search, had no idea Oak Barrels, Ltd. had so many choices available. You were very helpful, indeed. Simply stated ... you guys ROCK! Thank you for a great product, FAST shipping and excellent customer service! I'll be back for more barrels! I'm blown away by Oak Barrels, Ltd. customer service ... there are very few businesses that still run their company as they do! I love that I have the convenience of shopping online but can still talk to a live person directly. If you need to get in touch with them, they answer their phone day or night! My beautiful bride and I were wed last Sunday. Besides a little rain and some quick thinking by our wedding coordinator, the ceremony and the whole trip went perfectly. On Saturday, the two dads, the groomsmen, and I took a tour of Cisco Brewery and the Triple Eight Distillery. This is home to Whale Tail Pale Ale and the world famous Notch Scotch whisky among other amazing libations. This was an excellent time for all and was capped off by the presentation of the barrels I ordered from you a few weeks ago. Everyone was impressed by the artwork. They said it was a great touch and even the proprietor, Jay, who has 53 gal barrels of whiskey, rum, and so on lining his distillery asked about getting his own with the same artwork. Many of the guys later intimated that the tour and the personalized barrels were the highlight of the whole trip. However, no one was dumb enough to mention this in front of my mother, the coordinator, or my new wife who would be more than a little upset at even a hint that the ceremony wasn’t the corner piece of the weekend. As an added surprise, Jay filled each of the 2L barrels with his 100 proof Nor’easter Bourbon and is shipping it to each of their respective homes. The only barrel to not be filled was mine which, as you may remember, I had you send directly to my home address for expediency sake. Sad face! I want to thank you and all at Oak Barrels, Ltd. for the great craftsmanship, perfect artwork, and incredibly quick turnaround with the order as well as the special assistance you gave on account of my blindness. A couple side notes; The gentleman from the other barrel company who had been stringing me along for ever called only hours after receiving the shipping notice from Oak Barrels, Ltd. A little lost for a moment, I thought Oak Barrels, Ltd. had gotten something confused as the guy wanted to complete the order. Once I realized who he was, I informed him that Oak Barrels, Ltd had done in minutes what he had failed to do in months and I had no further use for his services. While I was not able to get my barrel filled with the rest of the guys, I was sent home with a bottle of Triple Eight’s 12yr old Notch Scotch Whisky. I will have to find something else to improve in my barrel because this stuff is already perfect. Thank you again for everything! You can expect future orders from me and, I’d be willing to bet, Jay and my groomsmen. We’ll have to keep that artwork for future orders. This company has a commitment to ensure their customers are happy. The product is excellent. The possibilities are endless. I bought one barrel with intentions of aging some fresh blackberry infused shine. I now have 5, yes 5 barrels. They are all for home use. The latest barrels I ordered were delivered and they were incorrect. Miscommunication. Hannah Piper, Director of Global Sales went above and beyond to make it right and it was seamless. She provided superior customer service. Great people, great service, great product. Can't ask for much more. I've never written a review before.....so, that's a testament to you and your company. Just a short note to let you know that I visited your new web site this morning, and it is BEAUTIFUL !! Very bright and clean, easy to navigate, it holds one's interest. Congrats. Thank you for the quick and thorough response. There are 8 of us planning to age spirits in anticipation of a holiday party. I have suggested they purchase from you. I'll pass on the info and see if we can combine our orders. Also, I have seen reference to your excellent customer service in some online forums. I am pleased to have experienced it for myself. Thanks for the personal touch. I just wanted to say thank you for the barrels. Quick delivery and great looking product. Received them today ... I will be getting more in the future. Check it out! Just bottled a Manhattan last night - aged it with mole bitters...holy hell - it was delicious! I just wanted to say thank you so much for the oak barrel ... this is how we drink bourbon Texas style! Oak Barrels, Ltd. is an absolutely wonderful company to deal with! I will send people your way ... very professional, great customer service and a fantastic product thank you again so much! The barrels just arrived and are PERFECT, the engraving is exactly right, everything exceeds my expectations, including delivery time. I am sure I will be buying more barrels in the future. I am ecstatic about the results from my barrels. I am a Scotch aficionado and use my 5L's to make my own personal blends. I take several of my favorite Scotches and combine them to make my creations - I record exactly what percentages of each that I use for each blend and save a bit so that I can compare and so my friends can compare - they can't believe the difference. It's amazing what the barrels do and how quickly it all happens. Thank you again! Your barrels are second to none. The craftmanship and coopering is exquisite. Thank you so much for being in business. Dear OBL ... I just completed ordering a 10L barrel with brass hoops for aging port and can't wait to get it. My girlfriend bought me 2 - 1L's (one for bourbon and the other for scotch) last year and they are among my most prized possessions. I'm using my scotch barrel to age some cognac right now and am eagerly anticipating my latest results. Thank you for a great product. I just received my barrel - thank you ... it arrived in excellent condition and I can't believe the craftmanship. I've been reading about the barrel-aged cocktails and decided I had to try these at home .. the holidays are almost here! My friends are going to love them! Thank you again for your great customer service. This is Mike R. I just wanted to thank you for your quick turn around on my order and to let you know I filled your barrel with Jim Beam. As you know, I purchased it to be donated for an auction to benefit the local VFW and it sold for $500. Several people commented on the fine workmanship of the barrel. Thank you again! Beautiful barrel with excellent workmanship. If one tenth of the people/companies responded as quickly and efficiently as you guys, things could get done so much more quickly and happily ... making for a more productive world/society. As for the pineapple, I decided to use a kombucha scoby to get things started ... we'll see what the results are! With barrel aging being ALL the rage here in Charleston, SC, you guys have great deals on the perfect sized bar barrels! I'll be ordering more for our place soon. Thanks for your great service and quick responses! Love Love LOVE my barrel ... I say "my" barrel - it's going to be the centerpiece for my favorite nephew's college graduation party and his gift to keep on his bar in his new apartment. he's going to love it ... I know ... the engraving looks awesome! Thank you for all your help and your special attention to details! The barrels are great, thank you! Please send two more - same logo. We've been loving loving loving our barrel aged balsalmic vinegar - it was absolutely awesome as a drizzled garnish over our grilled steak kabobs we had the other night! You've got a great product! The engraving looks fantastic!!! I can't wait to see the barrels in person ... thank you for your prompt and excellent service! Cheers! Took our special engraved barrel to last weekend's Buckeye's tailgating 'event'! Our friends loved, loved, loved our barrel-aged Manhattan's and couldn't get over how cool the barrel looked. You guys and your barrels are just exceptional! Thanks for a quality product, the awesome engraving job and your excellent customer service! Go Buckeye's! O-H-I-O! Hannah - It looks perfect! I totally agree with your decision to change the font. Thanks so much for giving me a call and for the voicemail. Again, I must say, customer service is excellent here. I can't wait to see the barrel in person! Can I just tell you ... Thank you - you're simply the best! Hannah ... thanks so much for sending another copy of my lost instruction sheet! We are having so much fun with the barrel - aging Manhattans and Vieux Carres! Your barrels are wondeeful and your customer service support is greatly appreciated. Cheers! What a great barrel! Exceeded my expectations. Gave it to my son as a birthday gift and he was impressed. The engraving looked really good. Thanks again! I'm incredibly happy with my order! I'd love to order another, same design, but would like the 2L. I'll give you a call! Talk about an awesome "Stock the Bar" wedding gift - can I tell you that your barrel was the hit of the party! I filled it with Makers Mark and everybody got a shot! Thanks so much for doing the special engraving - it looked great! Your product and customer service is the Bomb! I just received your email about your sitewide sale - think you probably just saw my order come in. I did a dumb thing a while back and purchased some barrels from somewhere else. They leaked and well the finished product tasted horrible. I spent a lot of money on barrels and product. I've purchased multiple barrels from you with great success and flavor. I learned my lesson and I'm back forever! Our wedding was two weeks ago - we served barrel aged cocktails from our "wedding barrel" we ordered from you. We mixed and started aging our Manhattans exactly one month before the wedding. Each guest was served one as we made toasts to each other. They were dynamite! We're going to make and start these exactly one month before each of our future anniversaries! Thank you for all your help - the laser engraving was perfect. You make a great barrel! Seriously - I am blown away. This has been the quickest and friendliest online ordering interaction I have ever had. Thank you, Hannah! I have been using your barrels for over a year and love them. I am on my 6th use with one of them. Still getting great color and flavor from it. I just purchased 2 more barrels and can't wait to use them. Thank you for your fantastic and fast service! This is my second order and EVERYTHING is as promised! Very nice barrels, thank you once again! They are now sitting peacefully on the rack filled with 140P rye spirit, where they will remain for a while - depending on tasting. BTW, I'm just finishing a small book for limited production detailing how to set up a small home distillery and make high quality Bourbon - I've included OBLtd as the go-to source for good barrels. My best to you! These are the best oak barrels I have ever bought. I started making my own whisky a couple of years ago, and one thing I learned is the most expensive part of whisky making is the barrel, and the most important thing about the flavor of the whisky is the barrel. I have had several barrels from other vendors that simply don't compare to your barrels. The other barrels appeared to be made out of old or used wood, perhaps old staves from previously used barrels. That greatly diminishes the quality of the whisky. It also increases the amount of time it takes to age the whisky, and decreases the number of times you can use the barrel. These barrels appear to be made of fresh, un-used wood and provide excellent flavor quickly. I have been able to use these barrels 2-3 times before they are spent. The other barrels were marginal for a single aging. From a quality and value standpoint, these are the best barrels I have seen. I call to ask a question - I call to ask a about a gift and how quickly I can receive it - you guys are always there to help AND your barrels are beautiful - handcrafted showpieces! Your customer service is excellent! Thank you again. We have ordered several oak barrels from you over the last couple of years - both personally for home and for our restaurant, Caruso's. I just placed another order for two 5 L barrels that got delivered today. I LOVE your stuff. Appreciate the product. I just wanted to say a big Thank You for the fantastic customer service I received when placing my order for the barrels. The oak barrels are perfect and I'm so glad I found your company as a supplier. I am currently aging whiskey in a one liter barrel - I've found that 32 -35 days is just about right for my taste! Some good stuff! Wanted you to know, my barrel-aged Manhattans were the hit of the New Year's Eve party! I love your barrels! We're hosting our neighborhood's Super Bowl event and our friends can't wait for the next batch! You have a great product - Thanks again! I just wanted to let you know how impressed I am with your customer service. You guys have just blown me away with your attention to detail and your helpfulness. This experience has been awesome! I appreciate all the updates, all the work you guys have done to make this happen ... again, I am so impressed. Kudos to you! Thank you - it's nice to see a company step up for their customers for a change. I will definitely be back to buy other barrels and supplies and goods! Can I tell you how FANTASTIC Hannah Piper is ... I have called her several times with a multitude of questions and Hannah has always been so helpful and knowledgeable. This is certainly not the norm these days. If I left her a message - she always returned my call in just a short time. I had to write this note - you just don't get this kind of service and care any more. I think she'll soon be President of your company! Your company does things right! Best wishes for a prosperous 2016! You guys are seriously the best! Amazing shipping speed, especially around the holidays. I'm really appreciative. Your barrel just arrived and it is awesome! I know I'll be ordering more for birthdays ... and maybe one for me. Hannah - thank you so much for your personal customer care. Thank you, just phenomenal SERVICE! Happy Holidays! I am the bar manager in a grill and bar in northern New Jersey. I have been using your oak barrels for over 3 years at my restaurant. I found your company when I was looking for groomsman gifts for my wedding and I have loved your barrels ever since. At the restaurant, I currently have 4 of your barrels that I use to age bourbon and other cocktails. Over the years we've even become known for my barrel-aged cherry vanilla bourbon and more recently - my cocktails. I appreciate you letting me know about my shipping date and I definitely know that the quality is far superior to other barrels. Thank you for taking the time to get back to me. Had to let you know that I got your Age-your-own Balsamic set a while back. I can not believe the difference the barrel makes to regular Balsamic vinegar. I have started using my balsamic in salad dressings - it is so so good. I did not put all of the vinegar that was sent with the set into the barrel - I use that leftover to compare how it did taste and how it does taste now. Wow! I'm ordering another bottle to add to my barrel when it gets down a little more and I'm getting 3 more sets as gifts for friends. Thank you! You asked me about sharing my Barrel Aged Port recipe - well, here it is. I make it in a 5L barrel - 10 oz of good brandy or cognac; 8 oz of Merlot or Cabernet Sauvignon; one big splash of bourbon and fill the barrel with any cheap Tawny Port. Start sampling in about six weeks - I ususally leave it in for about 2 months. When you're happy with the flavor decant into bottles and start over again! I've made a few batches it's good! I'm getting my next batch ready for the Holidays. Love your barrels. Good news! I got my barrels today. They look and smell great! I'm in the process of prepping them and all is good. I appreciate the craftmanship. I will be aging some wine in them and will be ordering more from you soon. Cheers! ...just ordered a barrel for a good friend who couldn't get over how great our Lemon Ginger Drop cocktails were at our Halloween costume party we had the other night. We used 2 bottles of vodka, around a 3/4 cup of Limoncello and and equal amount of Ginger liqueur - aged it in our 2L for around a month or so. Everybody loved them. Thanks for taking care of me again - love your barrels. PS We're working on a new one for our Christmas party - we'll let you know how it turns out."! I got 2 vinegar barrels along with a couple of jars of Mother just a few months ago - the mothers took off right away! We wanted you guys to know we are loving our vinegars - we'll never go back to store bought again. My son is going to school at The University of Texas in Austin. I got a10 L barrel for he and his fraternity brothers - they filled it with Tequila at the beginning of football season and get a shot whenever the Longhorns score a touchdown. They LOVE it! I was there last week and had to partake - I couldn't believe how much smoother and better the tequila had gotten - the barrel had really made a difference and that's why I'm ordering another one for myself. A new tradition has begun - Hook'em Horns! Thanks for your phone call answering my question on increasing the acidity of vinegar - you guys are awesome. We've been making red wine vinegar since I ordered my vinegar oak barrel in May 2012 - we get a batch every 100 - 120 days. We leave around 1/4th in the barrel and bottle the rest - it just keeps on making vinegar just like you said. Our friends are always clamoring for more. The vinegar is very good - store bought doesn't come close in comparison. Good to talk with you. Thanks for your quick return call and your help! I didn't even think to look at the instructions to prep the barrel for storage. We filled our barrel with wine Saturday night - all is well. Your customer service is the best! I'll be sure to recommend your company to all my friends and family. Thanks again! Thanks Hannah! A quick story about the Red Wine vinegar that I made. I got married on Oct 1, 2011 and we had red wine at the wedding and we had some left over. We have kept it all this time and we realized it wasn't as good as it was then. I did not want to throw it away, so I came up with the idea of making vinegar with it. So, I landed on your web site and fast forward to today. ... Well I can say I now have vinegar after many weeks and it is AWESOME! Best of all, vinegar has been made from our left over wedding wine! Like everything else, it is a learning process. In the meantime, I'm making vanilla extract in the 1L vanilla barrel I bought from you guys. A side note: for my birthday I received a 1 L oak barrel from another company and I had nothing but trouble with it. So, I decided to go ahead and get your 1 L barrel for the vanilla - it is a MUCH better barrel. The quality is markedly better than the other companiy's barrel. Thanks again! In the past I purchased 2 - 10L barrels and could not be ANY HAPPIER with the performance and character it has added to my custom spirits! It has been a new experience to me and Now I just ordered 2 more barrels and am looking forward to my next batch. Cheers! Thanks to all for your prompt, courteous and effective advice. Good customer service is a rare thing these days, in fact any service at all is rare and your company is a breath of fresh air. I spread the word.